When it comes to choosing a commercial garage door company in St. Paul, MN, the decision can be a stressful one for many business owners. Garage doors are an expensive investment that play a large role in keeping your operations running smoothly and gaining profit. Without functioning doors, many companies could miss shipping deadlines, lose company hours and other undesirable situations. O&L Door Systems offers a solution to the problem. We’ve been serving the region for more than 20 years, and our top priority is customer satisfaction. Whether you just started a new business or moved to a new building and you need a commercial garage door, or it’s simply time for an upgrade, we’ve got you covered at O&L Door Systems. We’re a proud Authorized Dealer of Clopay® doors, which means you can expect some of the most durable, stylish, long-lasting products on the market today. Whether you run a fire station, restaurant, warehouse, car dealership, service station or other facility, we’ll find an option that suits your unique applications. We don’t stop at installations. At O&L Door Systems, we also offer preventative and regular maintenance on both doors and openers so we can catch wear and tear early. Annual maintenance, inspections, fine-tuning and other services that we offer will save you money. We’ll fix minor issues before they require major repairs or replacements. This way, slightly damaged or unbalanced parts won’t be able to cause the rest of your garage door system to break down prematurely. 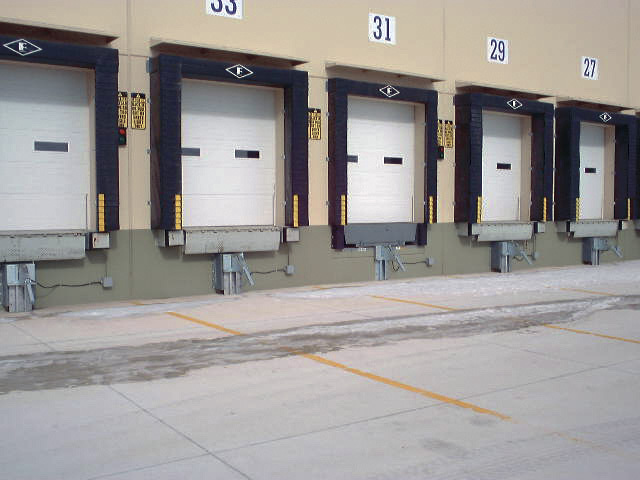 Why Choose O&L Door Systems for Your Commercial Door Services in St. Paul, MN? Speed: We never leave you high and dry. Every moment you must spend with vehicles and important products locked behind a door that won’t budge is a moment your business could be doing much better, and we know it. That’s why we make sure to stay ready to head to your location when we receive a call from you, whether it’s for installations, maintenance, repairs or replacements. Availability: In fact, to stick to our goal of staying fast, we offer 24/7 availability for emergency services. Day or night, your call will have the result of a qualified technician at your location. We will fully inspect your broken or malfunctioning door, provide a diagnosis for the issue, recommend the most affordable and realistic solution possible and then perform repairs and replacements to get you back up and running. Preparedness: We keep fully-stocked trucks on hand with the tools, components, and equipment we need to repair your door right away in almost all situations. We don’t want you to have to worry about back ordering and waiting around for a shipment when you have a garage door that won’t open. Training: Our technicians are highly trained and ready to complete repairs on doors or openers from any leading brand on the market. They’re committed to safety and professionalism, too. Whether you have questions before getting started, or something comes up along the way, we’re always happy to get you all the answers. Contact us online today or by calling (612) 623-1817 for your commercial garage doors in St. Paul, MN.